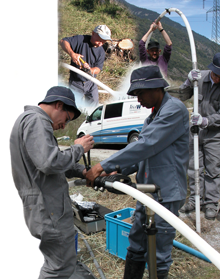 Obtain detailed depth discrete groundwater data using a CMT Multilevel System. Monitor up to 7 zones in one well. The Micro Double Valve Pump has a remarkably small and flexible design. At 3/8" (10 mm) diameter it is small enough to sample groundwater from channels of a CMT System. The Tag Line uses a weight attached to laser marked cable, mounted on a sturdy reel. Convenient for measuring depths during monitoring well construction.